I watched this film on the 29th of February but considering it didn’t get it published until today, it’s obvious I have been sitting on it for quite a while. Anyway, I can now say that I have proposed to a man on Leap Day, and on said man’s birthday no less. Was it a joke? Not really, I just wanted to wish a friend happy birthday and wanted to make it fun and different so this is what I texted him: “Hey hey! Happy Birthday! Oh, by the way, it being a leap year, and today being the day in question… Will you marry me?” First things first, before I go further, I have to declare that I am not making light of the tradition with the proposal made to my friend. It really was purely because I wanted to make it an interesting happy birthday message. As for the result of that proposal – Well, let’s just say that I am still single and definitely not engaged. Although, my proposal is probably the worst one ever, considering the fact that I proposed via a whatsapp message and I didn’t even have a (diamond) ring! No wonder he didn’t say yes! Anyway, I digress. But it is probably because the film didn’t really charm me too much. 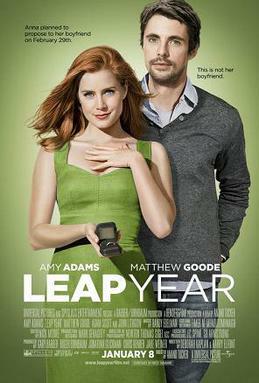 Personally, I think Amy Adams did an excellent job playing the lead female character Anna Brady. And Matthew Goode did a decent job as the surly Irish innkeepr Declan O’Callaghan. And it’s not that I dislike the film, I just don’t like it enough to watch it more than once or twice. However, one of the things I really like about the film was the moment when Amy Adams’ Anna pulled the fire alarm to see what items her fiancé would grab from their apartment. It made me ask myself, what items will I grab with me from my house if it were burning to the ground? The other question would be, who would I save first if my house was on fire? What is really important in our lives? What would I save first in a situation like that? There are many things we think we need, but we actually don’t. The bare necessities? Air, water, food, and clothes I guess. Maybe a house? Well at least a roof over your head. Money? Well you need money to buy the basics isn’t it? I really should ask myself this question the next time I mull over a purchase, is it something I really need? The other thing I really like about the film is because it made me think about marriage and how important it is who you marry. Because when I get married, I want it to be for the right reasons and with someone who marries me for the right reasons. What you might ask are the right reasons. Well, get married because you love the person. Get married because you are in it for the long haul. Get married because you are willing to accept the person for who he or she is, warts and all. Get married if marriage is something both of you are willing to work hard at to sustain. Cos marriage isn’t as easy as some films make them out to be.